After arriving at the cabin on a bitter January weekend last year, we found our drains were not working – the toilet wouldn’t flush, and the sinks wouldn’t drain. It didn’t take long to figure out what was going on. We had a frozen septic system. 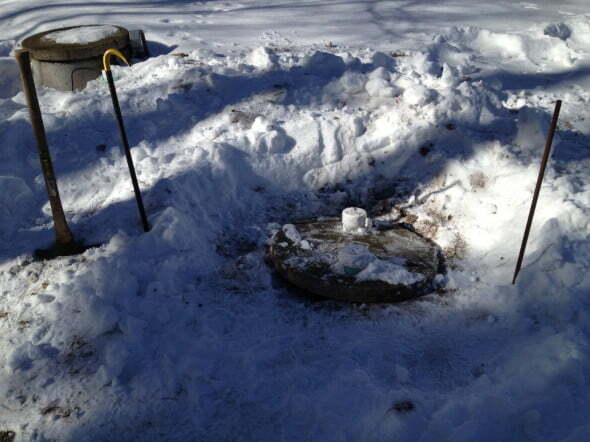 Domestic septic systems work remarkably well, even in frigid climates. However, given the right conditions, septic lines and holding tanks can freeze. What are those “right” conditions that allow septic systems to freeze? Stationary water in sub-freezing temperatures. Most septic systems avoid ice formation by the thermal protection offered by a buried system and the flushing and warming effects of routine use. Without these, systems can freeze. In our case, our system was bound to fail. It was a very cold January with little snow cover. Our relatively shallow septic line, without the insulating benefits of snow, was almost certainly above the frost level and plenty cold to make ice. In addition, we had not been at the cabin for some time, robbing the septic system of the beneficial warming and flushing effects of the home’s plumbing. The system was cold; all it needed was stationary water to form ice. Our water source for our frozen septic system? The furnace. As it turns out, the condensate water from our furnace empties into the septic system. This continuous source of low-flow water added to our cold system readily filled our septic line with ice. So, what could we have done to prevent this and how do we prevent it from happening again? The simple answer; keep the system warm and/or avoid introducing low-flow continuous water sources to the system. Frozen septic system line, showing ice formation in the septic line. 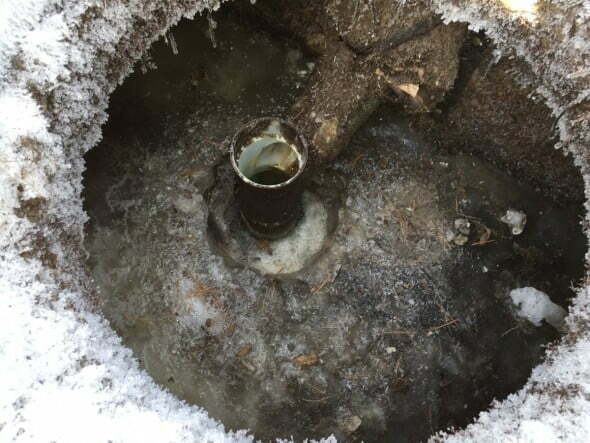 Septic systems can have many factors leading to ice formation. Each needs to be considered and addressed to prevent future freeze ups. But, before we can address the problems, we need to de-ice the frozen septic line and re-open the system. But, before you can address the problems, you will obviously need to thaw any ice within your lines and re-open the system. Your septic line is frozen, now what? Easy; thaw it out! To fix a frozen septic, you will need to thaw the ice that is blocking the system or line. I did this myself and you likely can too. 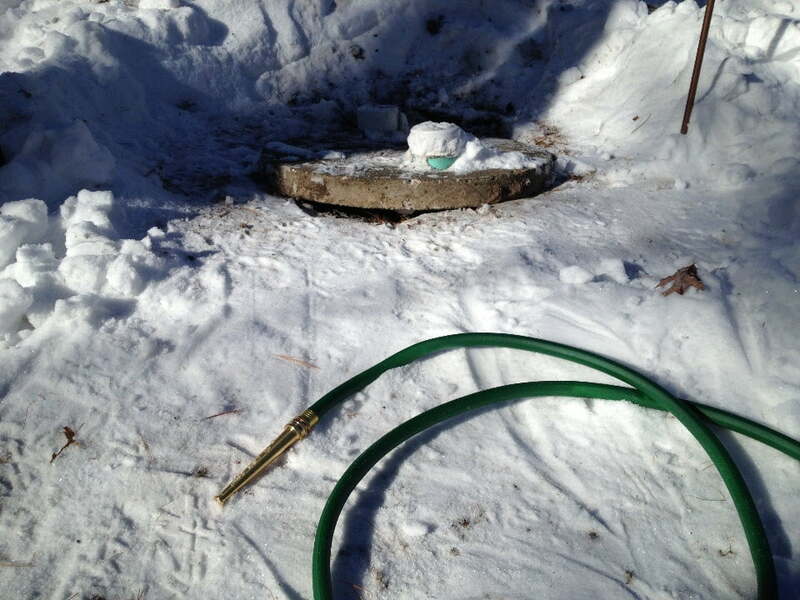 Before jumping into this, seriously consider calling a professional who specializes in clearing frozen septic systems. The first time my system froze, I did just that. For $250 the problem was fixed in 15 minutes. 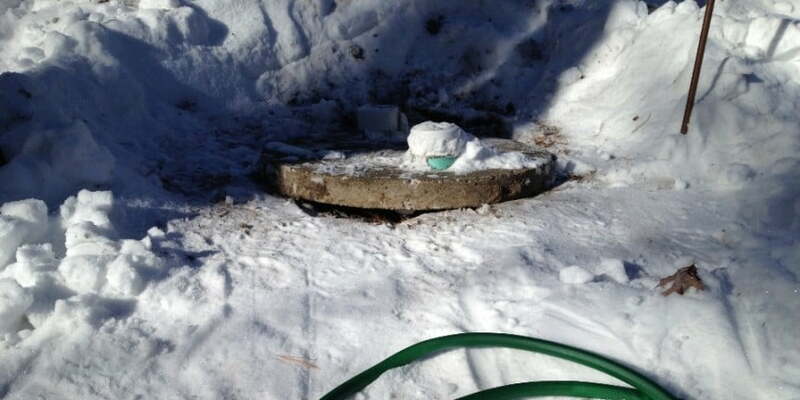 Like most projects, thawing a septic line yourself is a question of risk vs. reward. If you like the idea of staying clean and warm in your home while someone takes care of the repair, stop reading now and find the phone. But, if you would rather try this yourself, you will benefit from the process and learn more about your system, possibly helping you to improve your septic system and avoid future freeze ups. Pass hose into septic line. Run warm water to thaw line. Locate the first access cover of the septic system holding tank. Many systems have two access covers (one for the primary or “solid” compartment and the one for the secondary or “liquid” compartment). We are looking for the cover where the septic line from the house enters the holding tank (typically the cover closest to the house). 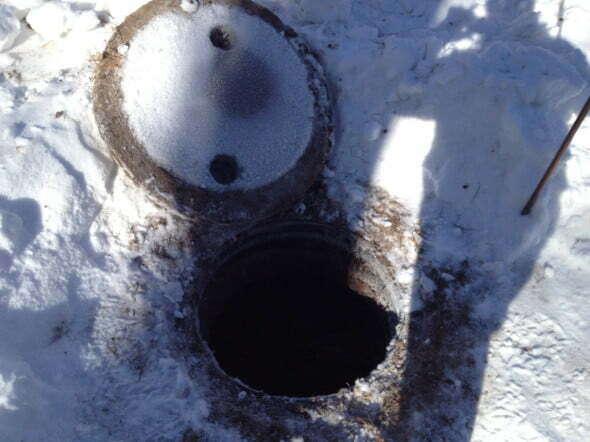 Locate and loosen cover for primary holding tank of septic system. This often requires a pry bar or crow bar to lift the concrete lid from the frozen ground. If the ground is frozen, take some time to trench out the dirt next to the lid. Lift concrete cover of holding tank. Gather your garden hose and nozzle. The nozzle should be longer than the diameter of the pipe (the pipe is typically 4″) to prevent the nozzle from turning in the pipe and therefore keep the stream pointing toward the blockage (Thanks to Nancy for the great tip). 50 ft. non-kink garden hose and 6″ nozzle. Ideally, you would use a source isolated from your domestic water supply, and therefore be sure the nothing from the septic systems mixes with your domestic water supply. Unfortunately, this may not be a realistic option. If you do use a source of water from your home — a hose faucet or utility faucet — use a back flow prevention valve to keep any water back flow from entering your domestic water supply. Most professionals use one of three water sources to clear ice from a frozen septic line: steam, pressurized hot water or pressurized cold water. I used a hose fitting connected to my hot water line from my utility room. It has the benefit of being fairly close to the septic tank and offered heated water. Hot water is not necessary, but will speed up the process of clearing the ice blockage. I did limit the temperature of my hot water to 110 ℉ to help avoid heat damage to the PVC sewer pipe. Most drain and sewer PVC pipe is rated for a maximum of 140 ℉. Knowing the temperature limitation of PVC, it may be a good idea to avoid thawing services that use steam to clear pipes as the heat from the steam can melt the pipes. Water supply with back flow prevention valve. Next, locate the septic pipe coming from the house. Hose passed into septic line with flush water on. Once you locate the line, you need to pass the hose, nozzle first, into the septic line so it is facing the blockage (heading back to the house). You may have to bend the hose slightly to get the nozzle into the septic pipe (I used a 6″ nozzle and needed to bend the hose a bit to get it in past the baffle). Turn on your water source and advance hose. 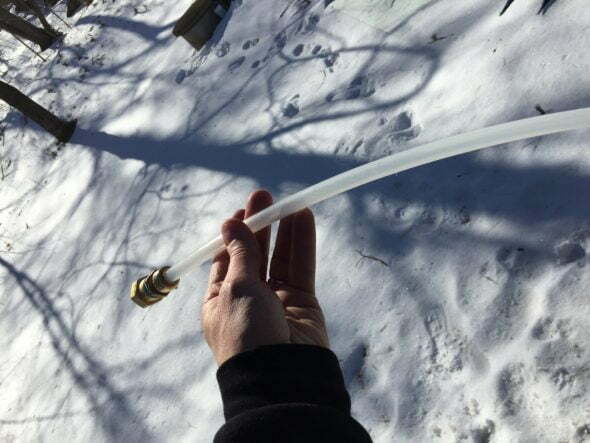 Feed the hose into the pipe until you encounter resistance (this should be the ice blockage). Now the nozzle will be spraying water directly at the ice. As the ice melts, you will be able to continue advancing the hose until the ice has melted and you are through the blockage. Depending on the volume of waste water in the septic line behind the blockage, it should be fairly obvious when the ice has cleared. In my case a the volume of water returning into the septic tank increased dramatically and the water was soapy with white suds. If you are but not sure if the line has cleared, you can remove the hose (leave the water on until you are out of the septic line to prevent backflow) and have someone in the house run some water (with soap if it will help you identify the water) while you monitor for the waste water to flow into the septic tank. 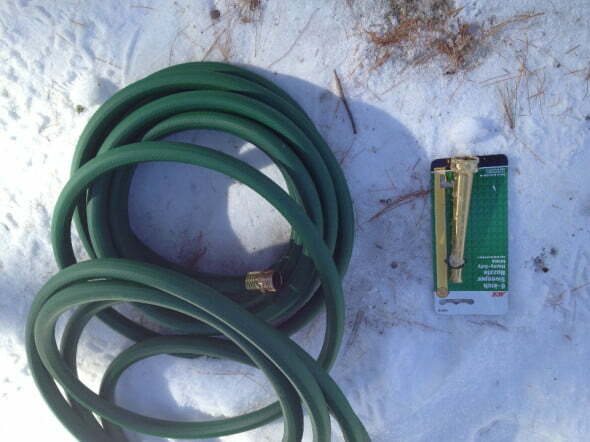 You may also use pex tubing to pass water into your frozen septic line. Use a Shark Bite connector and a garden hose fitting. Pex is stiffer than garden hose and likely not need a nozzle. Remove the hose before turning off the water supply. Removing the hose prior to turning off the water supply will prevent back flow into the hose. Replace the septic cover and clean your tools and hose. To clean the outside of the garden hose, I pulled the entire length of hose through a handful of Chlorox disinfecting wipes several times and finished by pulling it through damp paper towels. Fix the underlying problems causing line freeze. After you have successfully thawed the frozen line, you should try to identify the underlying cause of your system freeze and make appropriate repairs. There are many excellent resources available online and I have listed a few below. 1. 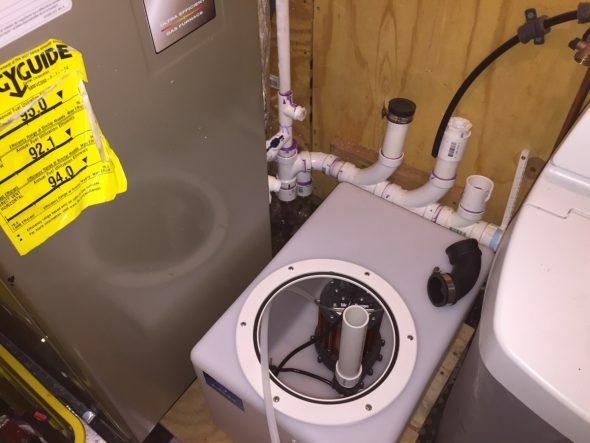 Preventing septic line freezing from high-efficiency furnace condensate drainage using a high-capacity furnace condensate tank and pump system. 2. 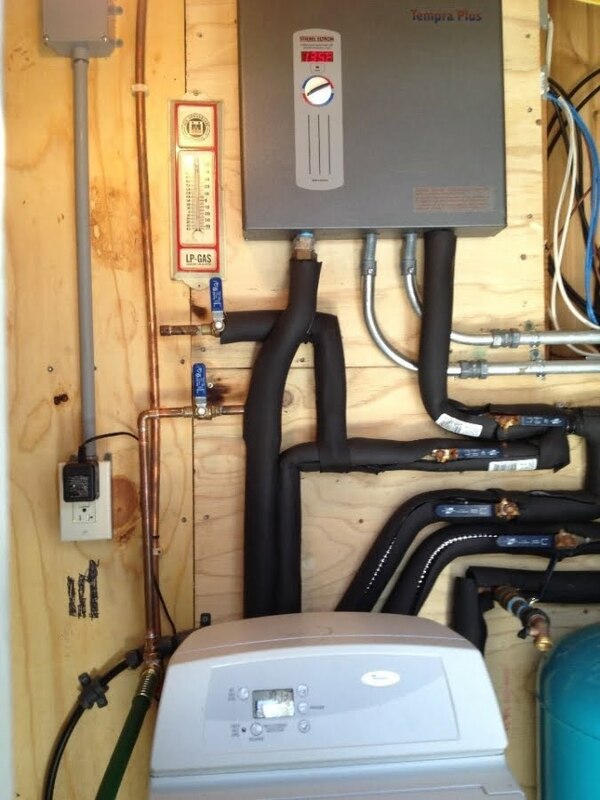 Installing a Septic Heater to keep your septic system ice free. Ensure adequate natural insulation over pipe run. Do not remove or compress snow over septic area (do not drive over or plow over septic system), snow has an r-value of 1 or more per inch of snow (12″ of snow = R-12+). Add layer of straw (R-1.5 per inch) or wood mulch (R-1 per inch) over pipe run and other areas of septic system or plant grass, vegetation in bare dirt areas over septic system. Add a layer or two of foam board insulation (polystyrene is R-5 per inch). Avoid compressing dirt over septic line (cars, atvs, etc) as compressed ground freezes deeper. Add insulation over and around septic system / line. Add 2 – 4″ of rigid foam insulation around septic lines, and over holding tank with over lapping edges (polystyrene is R-5 per inch). Use water softener salt bags, sand bags or bags of landscaping pebbles to hold down. 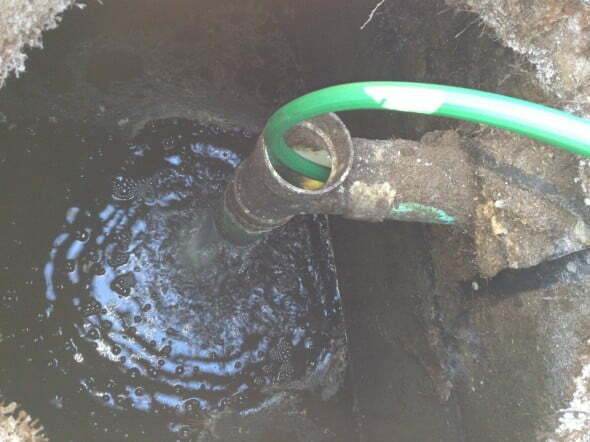 Fix or Avoid continuous, low-flow water sources emptying into septic line. Consider options for draining furnace condensation water. Use the system regularly during cold months. Normal bacterial activity generates heat in holding tank. 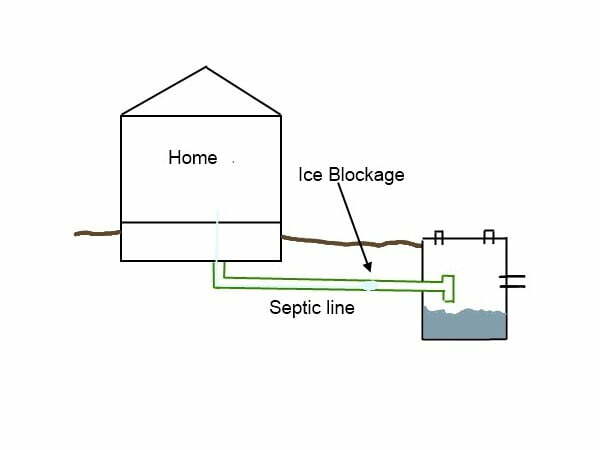 Diagram of ice formation in septic line leaving house. 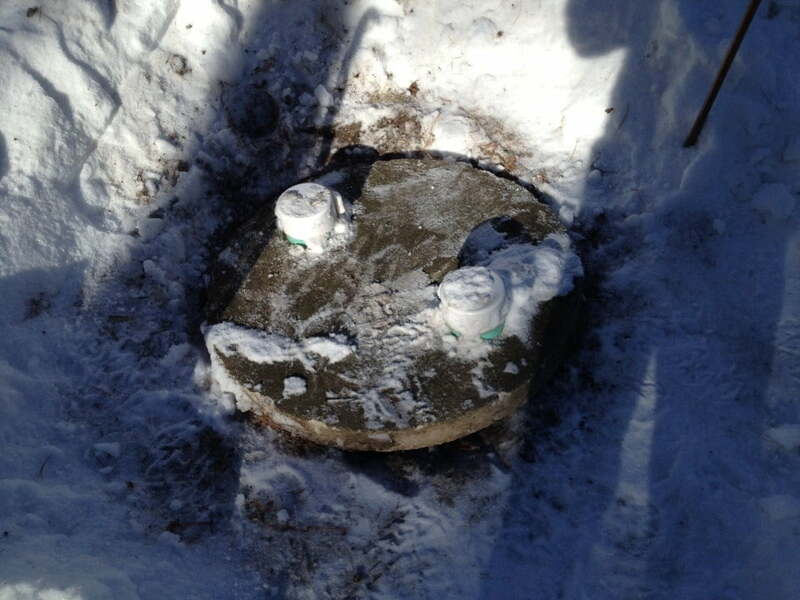 Frozen septic system line, cover removed ready to thaw. 6" hose nozzle used to keep water source facing forward in septic pipe. 50 ft. non-kink garden hose and 6" nozzle. Here is one more possible root cause of a frozen septic line… the ground has settled, and the line has a sag in it. The water that does not immediately drain can freeze in place if it sits in the line. You need to dig up the line and re-establish a continuous slope. Good point. In the past we would drive over this area with cars. I am certain the ground over the septic line has been compressed and likely there is some sag. I plan to insulate the pipe and will check the slope at the same time. Thanks! Your advice saved me a hefty plumbing bill! At zero degrees F. There was n way i could dig up the septic without hiring a backhoe. The plugged line goes from the house into a crawl space. So i disconnected the line where it goes out of the crawl space. I put the hose in and gradually fed it about 10 feet or more. That did the trick. The excess water just pouring into the sand n the crawl space and disappeared. This was pure plumbing magic. Thanks. Cause i had no idea what to do!! Took me all of ten minutes once the tools were assembled and ready. Awesome! Glad it worked. It sounds like you reversed the process and entered the soil line in the crawl space. The obvious down side to doing it this way is the emptying of the water / frozen pipe contents into your crawl space, but it sounds like you know what you were getting into doing it this way. Thank you for your writeup. I modified it a little bit. I was concerned about running hot water through a garden hose, but the hot water (red) hoses from the hardware store didn’t seem stiff enough to push into the pipe. I got a red hose and a 20′ length of PEX, as well as a PEX crimper, and garden hose to PEX adapters. The PEX worked very well for feeding into the pipe. Thanks again! Nice modification! You are right about the hot water and garden hose issue — the hose I used got fairly soft when running hot water through it. Glad it worked. Hi there, does anyone know why a line would break in the same area, two winters in a row? The area that was repaired was fine, it broke again the following winter down the line, just a foot ahead. Any ideas? Sorry to hear about the septic line breakage. For the pipe to break, some force is being applied to the line in that region of the pipe run. It could be caused by compression from above (vehicles or other force on the ground over the area), movement (home settling relative to the line run, unequal ground freeze with shifting) or expansion within the pipe (pipe freeze). If the pipe is iron or clay, it could be just deterioration in this area — I assume its plastic and this is not the cause. If the pipe is plastic and breaking, some force is acting on the pipe. Consider the soil conditions, the support under and over the pipe and any force from above (cars, etc). If this is an area of traffic (driveway, etc), you probably will need a way to protect the pipe from the loads over the ground in that area. If the area over the pipe is undisturbed, think of reasons the pipe could be moving. Let us know what you find. Upload a photo or two if you have some. Septic in Grand Rapids Minnesota area froze up. Has happened three times in last 10 years. Fairly easily fixed with conventional method (tank heater). Last fall added 18 inches of dirt plus foam plus straw. Bitterly cold winter so didn’t visit cabin much. Septic froze around the end of February Almost mid-May and line still frozen! Cover moved first of May. Super-insulating the pipe insured that once frozen it will stay frozen! May try your approach. Where is global warming when we need it? Wow, still frozen, that’s amazing. I assume your system is infrequently used during the winter and therefore you are not routinely adding heat to the pipe and septic system, making the insulation less of a factor. You could investigate wrapping the line with a heating tape or system designed to be safe with the pipe you are using (PVC, etc). I’m not familiar enough with these products to make a recommendation, but some of the newer tapes offer thermostatic temperature control and are low enough temperature to be used with plastic pipe. I’m not sure of there are products specifically designed for septic lines. From my reading, I would not recommend adding a heating tape to the inside of the line because of the risk of plugging within the line. Good luck. Let us know if you find a good solution. Any idea for type of hose to navigate two 90 degree elbows? My line between the tank and field is froze somewhere. I have a 90 degree 2″ PVC line at the top of the tank where it connects to the pump line coming from the bottom. The line than goes down about 11 feet to another 90 degree and into and through the side of the septic tank and out to the mound about 40 yards away. So I need to snake a small hose through the top 90 to and the bottom 90 and out to wherever the blockage is. Sorry about your trouble. I don’t have 90 degree bends in my system and I haven’t had to navigate them before. I would try a very short nozzle to try and get around the corners. Not a septic problem, but a sump pump line problem. I have lived in this house for 30 years, now, all of a sudden, last year and now this year 2015, the line going from my basement sump pump to the ditch has froze up. Why? I am in NE Ohio, last year we had record breaking cold spells, but not this year. Why is this happening? It is that black, rubber looking, 1 1/4 inch line that is froze up. Last year I had to run a line from the sump pump, out the basement window into a field for months until the spring thaw. Any suggestions how I can thaw out this pipe? Is it more than likely frozen near the open ditch it empties into? That part of the line is only about 10″ deep in the ground. What about using a product called Liqui-fire? Would it be safe to run that through my sump pump to get it into the line? What about laying those electric heating wires used on roofs to prevent ice damns on the ground over the last few feet of the line near the ditch? Please, any and all suggestions would be welcome. Sorry to hear about your problem with your sump pump discharge freezing. This seems to be a common problem in cold climates. Most sump pump discharge circuits are attached to corrugated black plastic drain pipe. This type of pipe traps water and can easily freeze. The only way to prevent ice build-up within your discharge circuit is to either have a system that stays above freezing (difficult — must be burried below frost line and still drain away from the home) or have a system that empties well and prevents residual water build up. To improve system emptying, use larger diameter, smooth wall pipe that is well pitched away from the home. 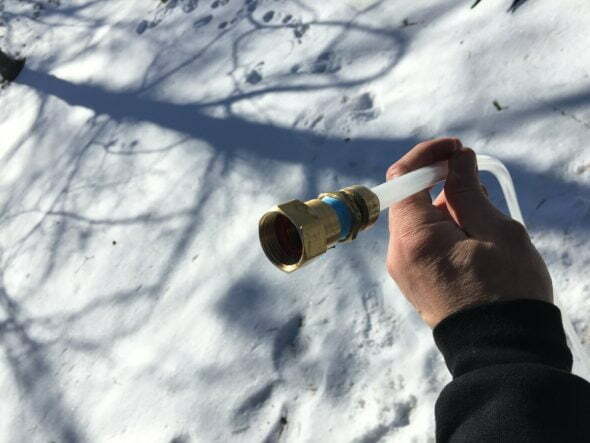 Some recomment disconnecting the flexible plastic pipe in the winter and instead adding a larger, smooth walled short segment of pipe to direct the discharge away from the home only a short distance during the winter. Some will even just allow the water to drain next to the home during cold months — this may not be a good idea as the water will typically just find its way back to your basement. Each situation is different and the best solution for you really depends on your system, yard, etc. I would call a sump pump installer for help if your system is complicated. As an emergency measure you could direct you discharge into a laundry sink or drain until you can get the system fixed. Beware that many local codes prohibit discharging sump water into septic systems, as it tends to overload these systems. Am wondering if it is too late in the season to use that blanket, and if I do will I push the frost down in to the pipes more?? Thermal insulating blankets (a.k.a. insulated tarps, concrete insulation blankets, polythermal blankets, etc.) work by providing insulation over a surface. In the case of concrete, the concrete produces heat when curing and the blanket retain the heat over the concrete. The blankets retain available heat. In the case of a septic line, the thermal blankets would be beneficial in preventing freezing (just like snow cover, or other added insulators (straw, etc.). This is especially true if you are actively using the system and adding heat to your septic with your waste water from the home. If you system is already frozen, I doubt the blankets would help much in the short term. The blankets will only help to retain the existing heat, for this reason, using blankets only would like take several weeks to months depending on the heat in the ground. I have used thermal blankets prior to digging after the ground was frozen (late November in Minnesota) and they did a remarkable job of breaking the frost (which was relatively shallow in November) over the covered area in just a day or so. One issue with thermal blankets is their cost. Expect to spend $100 – $300 per blanket depending on the size. For this reason, many simply use a layer of straw or other natural insulator. I would search the internet for thermal blankets and compare the insulating R-value vs. other, less expensive insulators. If you didn’t mind the aesthetics, you could simply buy rigid foam board, like a foil covered polyisocyanurate foam board, from you local home improvement or hardware store. These products have very high R-values and are reasonably priced. 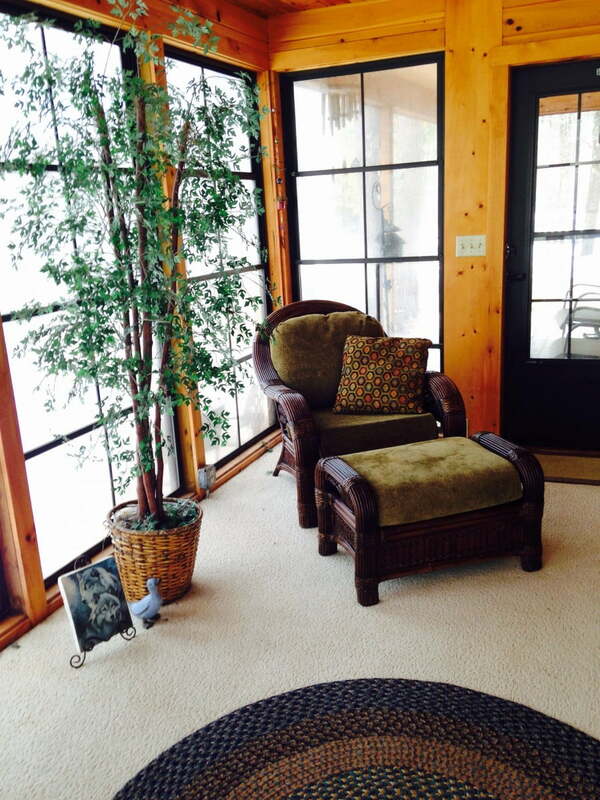 Best of luck and thanks for the photo of your cozy home. Thanks for the comments and great idea. Funny you should mention your furnace condensate, as I am up at the cabin right now working on a sump system to help avoid the same issue. My septic line was frozen again this weekend and the only source of water in the system when I am away from the cabin is the furnace. Curious about just how much water drains from my high efficiency furnace, I did a little experiment and measured the water volume over a 24 hour period. During the 24 hours I measured and heating our 700 sq ft cabin to 72 ℉ during the day and 66 ℉ at night, I collected almost 7 gallons of water! This water is continuously drained into my septic line just outside my home from a small heated pump house connected to the cabin. Considering the benefit of avoiding this continuous water source and instead dumping the furnace water in larger volumes, I plan to build my own condensate removal sump system. I considered using a commercial condensate pump, but those units have only a gallon or so of capacity. I would like to build a system using a thick poly water tank and an aluminum sump pump. Also incorporated into the system will be a drain line connected to the top of the poly tank, above the level where the sump pump would kick in, to act as a safety drain in case the sump pump failed. Once I get the parts I will drain the furnace condensate water into the 16 gallon tank. I will place the sump pump in the tank and pass the discharge pipe from the sump pump through a hole i will cut in the top or cover of the tank and connect it to the drain going to the septic. Once the water level in the tank is high enough to trigger the sump pump, the pump will discharge all of the water in the tank at once. Now instead of a slow drip of water, I will get large volume (several gallons or more) dumps once a day or so. Hopefully these larger volume dumps will flush the system and not freeze in the pipe. Given the thermal mass of these large volume dumps from the sump system, I seriously doubt the water will freeze on the way to the septic tank. As an added precaution, I plan to drill a hole at the top of one side of the tank and connect a drain line that will also go to the septic drain circuit. The purpose of this drain, will be to act as a emergency drain if the sump pump fails. If water ever reaches the level of this drain, it can empty before the tank overflows. This is especially appealing for our often vacant cabin. Unrelated to the furnace condensate issue, I also purchased and installed a Septic Heater from the Septic Heater Company. I plan to update this article to include a discussion. They are expensive, but so far it seems to be a very good solution for my repeat freeze-ups. I will upload some photos of my furnace sump build in a week or two after I get it built. I read your response and it sounds like a good plan. I have not decided on how I am going to solve this problem yet but i am researching solutions. For now i am just letting my condensate dump into a plastic 55gal drum that i have a sump pump inside and i will drain thru a window from my bsmt when i am there every week or two. I am only keeping my place at 55 degrees so i am getting about 7 to 10 gals of water a week (it will be more when it is colder outside). I talked to one plumber and he said he ran his condensate line right along the top of his exhaust pipe and that kept it warm enough to prevent freezing after leaving bldg. The only problem i see with that is unless you exit bldg high up it will probably create a big icicle connected to the ground. also it would be dumping a lot of water close to bldg foundation (frost in ground) etc, which could cause frost heave problems down the road. What gets me is that I told my septic guy and heating guy that i would not be present all the time and i wanted a turn key operation without these kind of problems. My heating guy said that’s where a 80% eff furnace would have been better, yet he never mentioned it when presenting his proposal. I was looking online yesterday trying to figure out how I could solve my problems once and for all. I found a website selling Septic Heaters. I actually ordered one and had it delivered yesterday. I installed it and ran it continuously overnight and my frozen solid holding tank is now nearly thawed. 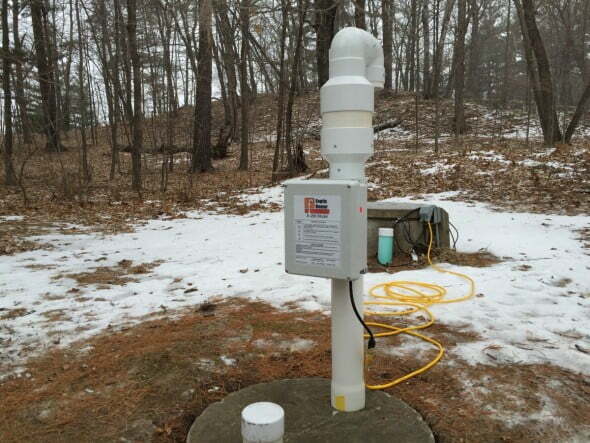 The unit uses warm air blown into your septic system to prevent freeze ups. The unit mounts over any of the 4″ PVC caps in the system. The heater offers a manual “always-on” mode and an automatic mode that is thermostat controlled to keep the ambient temp in the holding tank (or where ever it is installed) above 38 ℉. I haven’t had much time to use it yet, but so far it looks to be the solution I have been looking for. I know the unit is not intended to thaw an already frozen system (it clearly states this on the website and in the product literature), but seeing the results so far makes me confident that it will keep my system open and running once the ice is thawed. Septic holding tank frozen solid. Septic Heater A200 septic tank warmer installed and run for a day. Holding tank largely thawed after running the A200 Septic Heater on manual mode for a day. Does this heater use a dedicated 220 circuit? Totally agree, happened to me for the first time in northern Michigan this weekend. I also asked for turn key and they installed the high efficiency furnace thus I have the condensate pump issue to deal with as well. I left a trickle going to keep intake pipes from freezing along an uninsulated wall, but ice accumulated in the sewage drain that was installed circa 1950, and at frost level with no crawl space. Good times. Without flooding the bathroom, any suggestions on how to dethaw from the top? My father suggests borax, but I worry having a chemical reaction on old stressed pipes. I’m open to suggestions. Bummer. I’ve learned that a low flow source of water + cold septic pipe = ice! I’m sure you are all over this, but I would not leave any source of water on and, instead find a way to warm the supply lines (heat tape, re-route them, etc.) in the future. As for the current frozen pipe, I would consider trying the same technique discussed in the article. If introducing water from the insider, you will obviously need to consider the issue of the return water as you are thawing. I would try and find access to the septic as close to the ice as possible. Hopefully your system has a clean out or similar that you can access. I would then devise a system that would deliver a lower volume (less to catch) of warmer water — use a nozzle set for a small stream or use thinner hose (3/8″ pex or other) and slowly advance into the pipe while somehow catching the return water. To catch the return water, you might use a wet vac or similar. Obviously, anything you use will need some thorough cleaning (bleech) after. If you do not have access or it sounds like a total mess, consider calling a plumber who specialized in clearing frozen systems. It will run you $200 or so, but might be worth it when you consider the mess this will likely be. Shoot! I had the same issues two weeks ago. To thaw the tank (and hopefully both tanks), you need to add heat to the system. You could use warm water, but you run the risk of having no place for it to go if the second (lift) tank or drain field is also frozen. Some use tank warmers made for cattle water tanks. You could also use a heating cable made for melting ice on your roof. Once the ice is thawed, then you could proceed with thawing the pipe as above. Open flame heat sources are a bad idea as they could ignite methane and other gasses from the tank. It is possible your line is not frozen, but only blocked by the ice in the tank. Once you thaw the tank you could see if the line is open. As far as keeping the tank open, from my reading bacterial additives are probably not meaningfully helpful. Waste added to the system supplies more than enough bacteria. It does sound like this is mainly a problem (like many this year) of too little insulation (snow) covering the system. I would add insulation by adding straw, foam board, heating blankets, etc. and consider an external heat source when you are away. Some use livestock tank heaters or heating cables placed in the holding tank(s) for this very purpose. There are potential issues doing this un-attended. I bought a heater designed for this very purpose from the Septic Heater Company. They are expensive, but mine seems to work well. As a last resort, you could always call someone who does this everyday. They would likely have you fixed in a few hours. You could then work on prevention once your plumbing is back online. Great comments/ tips. It might be expensive but I’m thinking heat tape on my condensate line and the tank heater that was mentioned earlier. Crap! Went down to our laundry room yesterday morning to find white water all over the floor. Had my husband go check the first tank and it is full clear up to the top. So then checked the 2nd tank it is frozen. We have a lift station system and I am really concerned as to what this may have been caused from and what damage it may have done. We are in northern Minnesota with no real snow cover and a system that is only about 2 years old. We called to have the septic pumped and are waiting to ask him what we can do. Any suggestions? First I had to get all the waste water out of the system. I located the clean-out cap on the pipe that leaves the basement. I realized that if I just took it off, I would be inundated with a fire hose worth of slop. I drilled a 3/8″ hole in the cap, near the bottom but safely away from the threads, to let the water out. Even this small hole released a fierce flow, and it comes fast so get a helper ready to catch it with a bucket. They may get wet. Be ready. I protected my drill by drilling through a sheet of plywood as a shield and then into the cap. A smaller hole might be a good idea for the faint of heart. I continued a two bucket brigade, dumping each full bucket outside while the other filled up. I was lucky that there were no solids in there that might have caused more issues. If you do get wet, it’s not that bad. The slug of water near the exit is almost all pump condensate, which is relatively clean, but try not to drink it. Once the flow stopped, I removed the cap, again with a bucket handy to catch whatever comes. Inside I could see a solid block of ice in the exit pipe. Fortunately, my hot water tank is close to my exit pipe and it’s plumbed with PEX. I also have ball valves in and out of my hot water tank to facilitate any issues I might have with it. I was able to close the hot water out ball valve and then pop off the hot water exit after the valve. I had a length of 1/2″ PEX long enough to reach from my hot water supply through the exit pipe to my septic tank. In the end of that PEX pipe, I fixed a pipe plug, but I first drilled a 3/16″ hole through the center of the plug. The small hole reduces the amount of water that backs up to you and also increases the pressure of the flow. I placed the plain end of that pipe into the valve exiting my hot water tank. I would use the ball valve to regulated flow. I got my buckets lined up again and pressed the end of the PEX with the drilled plug up to the ice dam and started some hot water flowing. I kept working the PEX forward and used the valve to optimize the melting/back flow relationship. I was able to push the PEX past a right angle bend with modest effort. After a while, the back flow stopped, which means the water is all going to the tank. A very satisfying moment indeed. A new clean out cap. A 3/8 drill bit and a 3/16″ drill bit. You may want to go a bit smaller than 3/8″ in the clean out cap. A ball valve on the end of that “tee”. At least two buckets, I prefer the 5 gallon variety. Sorry for the lack of pictures, but I was in no mood while this was going on and my wife wanted use the toilet. Thanks for sharing. I am in the middle of building a condensate sump system for my furnace. Hopefully, I can avoid future freeze-ups by eliminating the slow drip of the high efficiency propane furnace. I should have an article completed in a few weeks. I did a little experiment and measured the amount of water my furnace was producing each day and was surprised to find out it was over 5 gallons! I decided to build a condensate sump instead of using one of the smallish ones that can be purchased as they tend to hold less than a gallon and likely pump put each time the sump has few quarts in it. In my head, I like the idea of a less frequent, large volume discharge of many gallons. That volume of discharge and it’s thermal mass make it very unlikely to freeze on the way to the tank and likely a good “flush” for the system. To build it, I am using a 16 gallon roto molded plastic water tank and a smallish 1/3 hp sump pump. 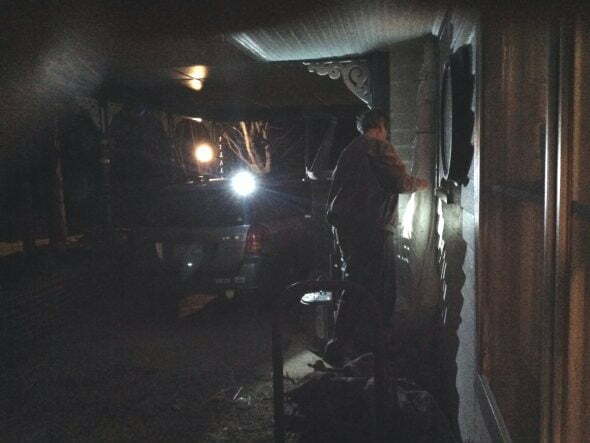 Last night after a week long trip we returned to our North Carolina 100 year-old farm house and discovered the soil line draining the upstairs bath, sink and toilet was frozen. My husband took the electric blanket off our bed and zip-tied it to the ten feet of pipe fully exposed on the out side of our house. It is still frozen. It may seem obvious to a plumber that we were living on borrowed time, after owning the house for seven years without a problem, but it never occurred to us tar heals. Assuming we ever get it defrosted, how do we insulate it? Sorry to hear of your frozen soil line and thanks for sharing with us. Judging from your photo, you look to have an interesting problem. It looks as though your soil line is outside your home running along the wall. Although I’m not a plumber by trade, I would guess the proper (and obvious) fix long term is to rebuild the exterior wall and incorporate the waste pipe within the wall. The wall would likely need to be framed 2 x 6 to make room for what I would guess is a 4″ pipe. Short term, I would suggest insulating it and maybe even wrapping it with a heating cord under the insulation. You will need to use care in choosing a heat tape product designed to be safe with the pipe you have. If you install heating tape under insulation, check carefully that the insulation you plan to use is safe over the heating tape (should be discussed in the heating tape instructions) – some foam pipe insulation may not be suitable over heating tapes. Short term, you will need to get some heat into the frozen line. If you have access to the inside of the pipe (unlikely), for instance by way of a clean out or similar, you could try and use warm water through a hose or tubing – but this would likely be difficult and potentially very messy. If you do not have access to the inside of the pipe, you could try using a hair dryer or similar. If you have some time, you could purchase a heat tape, wrap the pipe, insulated it and give it a few days. If all else fails, a plumber would likely have you cleared up in a few hours. Our condo is really a duplex, attached to one other unit. We have a shared attic & crawl space, and our own septic tank & field. These units were winterized in the past, but ours not this year so we could use it. We rent it out during as much of the nice weather as possible. This all equals low use, I know. Our home inspector made us aware that there’s no insulation in the attic or crawl. The bucks haven’t been there yet to rectify that, but it would also have to involve the association. Our newer wall furnace actually blows into the crawl a little, so we hoped that with securely covering the 4 crawl vents on our side, would help. And we covered the septic tank cover with lots of mulch. And of course we’re leaving cabinet doors open, but were unable to get the association to agree to leave water dripping. So far this month, our neighbors have frozen pipes in their unit again … ours have not frozen, but evidently the septic is frozen, as water won’t drain. Our association maintenance man is working on keeping everything going, in & out of our units daily, and has our heat at 68-70. We are dreading the gas bill! This winter will hopefully be done soon! In the meantime, we need a plan of action for next year. Closing the units for the worst months has been discussed. I’m told we’d turn off the water, back drain the pipes, but anti-freeze in the drains, and back the heat down to minimum. This should prevent our pipes from freezing, right? But I don’t see how it would keep the septic from freezing? Anyone’s suggestions would be helpful! 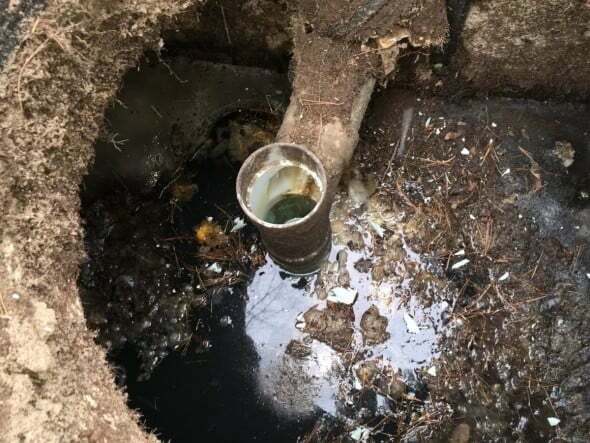 Concerning the septic system – I tend to think about the septic system as two parts; 1) The septic tank and connected drain field, and 2) The septic line or soil line – the pipe(s) from your home’s drains to the septic tank. The septic tank is typically a large (1000+ gallon) storage tank that collects all the waste plumbing from your home. Once there, the liquid is pumped (or drained) to a drain field where the water is absorbed and processed by the soil. Solids stay in the tank and are periodically emptied by your local septic “pumping” service. Normally the septic tank should be warm enough to avoid liquid in it from freezing, it will still function as a reservoir even if the contents are solid ice. The problem is, without the typical active removal of the water into the drain field, the tank will fill up more quickly. That said, using a frozen septic tank can thaw it by the heat gain from waste water. An active system also generates heat from the bacterial action within the tank. The septic line is typically a 4″ plastic pipe that connects the septic tank to your home drains. The drain plumbing in your home passes through walls and floors and eventually connects to the main pipe (often called the soil line) leading to the septic tank. Those individual drain lines probably join the main soil line in your crawl space. If those drain lines or the main soil line is below 32° and the proper conditions exist (stationary or slow moving water) ice will form. Once enough ice forms within a pipe, water will no longer flow, and, in fact, additional water may add to the existing ice. However, a cold pipe without water will not form ice. Your system can get cold and still function normally. Even if you are away for some time and the system is cold, resuming normal plumbing use when you return will re-warm the system. Large volumes of water (toilet flushing, showers, washing dishes, etc.) add warmth to the system and provide beneficial flushing effects. In contrast to normal use, slow moving water sources are problematic. Continuous, slow-moving, low-volume water added to cold septic lines and tanks tend to form ice. Slow moving water provides the substrate for ice without the flushing and warming benefits of periodic, larger-volume water “dumps” associated with normal plumbing use. Furnace condensate drainage, toilet leaks, leaking faucets, and other drip, drip, drip sources of water easily freeze and should be avoided. Leaving a faucet dripping to prevent the supply plumbing from freezing is exactly the type of water source to be avoided. To keep the septic and drain pipes open, they need to be above 32&deg, or dry. To keep the septic tank and drain field working, they need to be above 32°. This is difficult in idle systems. But, cold systems can warm once you resume normal use. To improve the tolerance of the septic tank and drain field and help it retain heat, insulation is important. Snow is a septic systems friend. Every inch of snow provides an ~ R-1 insulation benefit. This is why many systems freeze during snow-free, cold winters. This is also why many homeowners will cover their septic systems and drain fields with hay, mulch, leaves, thermal blankets, rigid foam insulation, etc. To fix your issues, you will need to first open the blocked pipe(s). Once the system is thawed, you should winterize the system the best you can by adding insulation or heat to the system and pipes. If you have access to the pipe within the crawl space you can wrap it with a heating tape designed to be safe on pipes, then wrap the heating tape with insulation (designed to be safe overheating tapes). To open your blocked pipe(s), you can try the method described above and pass a hose with warm water running to try and clear the blockage. You may need to call a plumber, but they are more than equipped to open the blocked pipes fairly quickly. The trade-off is money. A plumber will run you a few hundred dollars depending on the complexity of you issues. To keep your septic tank warm and functional, insulation will help. Adding heat will help. As you probably read above, some will use livestock water tank warmers in the septic tank to help keep it warm. They are relatively inexpensive ($50) – but if you decide to use one, you should check with local codes. There are commercially available heaters that will attach to the septic tank lid and blow warm air into the system (I bought one myself). They work well but are expensive. Once you get your system open, avoid low flow sources of water to prevent refreezing of the septic and drain lines. I had a high-efficiency furnace dripping into my septic line that was the cause of my ice formation. I fixed it by building a high-volume condensate tank and pump system. I would strongly advise against running water while you are away. If you are worried about the supply plumbing freezing, better to turn off the supply water and drain the system or turn off the supply water and keep the home and crawl space above freezing. Thank you Gary, for the complete response! This answers a lot of our questions! Had my septic tank and drain field freeze up, had to use 3/4 inch drain cleaner tape with a hose and nozzle taped to the end and cleared about 25 ft of pipe from the house to drain field shooting hot water all the way, no way would just a hose have done that but I guess if the freeze was close to the tank a hose would work, Took about an hour and a half but I saved $300. Cost me $210 just to come out and empty the tank so I could get at the inlet. Thanks for sharing your project. After clearing my frozen septic line a few times, I agree – standard garden hose is a bit to flexible for long distance runs. I did use pex tubing connected to a garden hose adapter, which is much stiffer and stays rigid even with warm water. We believe that our septic is partially frozen. We discovered the water over the two drains last night. The backed up water drains very slowly. There is some bubbling and gurgling when we flush the toilet. We took showers this morning and the water did back up a bit and has drained since. Last week, we discovered that our pressure tank for our well was not functioning properly. It was replaced, but we are now burdened with a leaking hydrant someplace underground. This will have to be dug up and replaced or capped off. We have to turn off our tank and pump before we go to bed and then again in the morning when we leave for work. We the know the frozen septic only occurred during the past week. Our temps plummeted to 15 below zero for a few days. We have no snow and our septic is very shallow. We do have a leaky tub which may have caused low amounts of water to drain and the freeze up. I was hoping that if we continue showers and running hot water (from our washer) into the septic, that our pipe may thaw. We are expecting temps to increase to 50 degrees during the next couples days. The septic is on the south side. Hopefully, nature will be on our side. If not, I will most likely need to place that dreaded call to help unthaw our partially frozen line. Thanks for the information. This site has been extremely helpful. Thanks for sharing, and sorry to hear about your problems. Unfortunately, I would guess that your septic line is frozen and the slow draining your experiencing is just waste water re-distributing throughout your drain lines in your home. I would consider getting the line cleared before you have issues with backed up wastewater in your home. As for your well issues, do you have a check valve (one-way valve) installed on your supply plumbing coming from your well? It is possible that your pressure tank issues may be related to an absent or malfunctioning check valve. A check valve is a one-way valve that will allow water to move forward through your plumbing, but prevent water from moving back into the well. I have had this very issue with our pressure tank and well pump cycling very frequently due to water moving out of the pressure tank and backward into the well. A check valve prevents water pressure loss back through the well supply circuit. Depending on your well pump, your system may have a check valve incorporated into your pump called a foot valve. 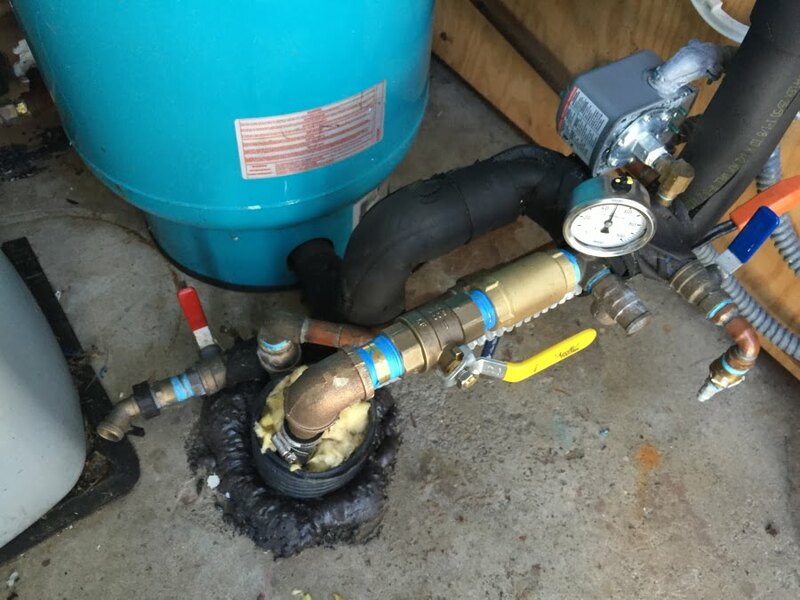 If this valve is malfunctioning, it may allow water to return from your pressure tank and supply plumbing into the well, causing pressure loss and frequent pump cycles. Some systems have line check valves installed along the supply plumbing line just after the connection from your well, before the pressure tank. These line check valves allow water to move into your supply lines and fill your pressure tank but prevent backward water movement and pressure loss. With a properly functioning check valve, water can only move forward into your home, and your pressure tank should not lose pressure unless you are using water. It is also possible you have a leak in your home plumbing, causing the water and pressure loss. If you have a shut-off valve on your supply plumbing between the well and your pressure tank, you should be able to determine where your system is losing pressure. To check, turn your well pump on and allow the pressure tank to fill. Once the pressure tank is full, and the system is at operating pressure (40 – 60 psi or so), close the valve between your pressure tank and the well (and turn off your well pump to prevent the pump from operating against the closed valve). If the system holds pressure with the valve closed, then you are losing water back to the well – think leak in the well circuit or malfunctioning foot check valve. If your system loses pressure with the shut-off valve closed, then you are losing water after the check valve, in the housing circuit – think plumbing leak, running toilet, etc. I had the same problem with our system losing pressure back into the well. I installed a check valve, and fixed the problem. I realize I will need to determine if there is a malfunctioning check valve in the well and replace it, but for now the line check valve prevents further back flow of water. Depending on the type of system and pump you have, you might need a line check valve or need to replace a malfunctioning one. Just some thoughts to potentially consider with your well issues. Here is a photo of the check valve in our system. The check valve is the brass tube fitting just to the right of the yellow handled shut-off valve. Check valve to the right of the shut off valve prevents water flow and pressure loss back to the well. Reading all the comments gives me some idea of what’s involved. My septic pump alarm tells me it’s frozen at the pump or after. As this is a second home, I wonder if it is feasible just to wait until the spring thaw. This is the 1st year that it has frozen but temperatures are at record lows in north west New Jersey. Should I wait or pay? I would like to know where the weakest link is. Warmer weather may be just around the corner. Here is MN it has been in the 50s – 60s this week. You decision to wait probably depends on how much you need the system. It sounds like you haven’t had issues with water getting to the tank, just getting water out of the tank. I would try and inspect the holding tank just above the pump if possible by inspection cap or removing the cover. If the tank has liquid in it, it has to be your connection to the drain field or a dead pump. If there ice in the tank, you probably just need to thaw the tank contents so the pump can drain the tank. You may be able to run some warm water around the area of the pump to free up the pump and see if the pump will trigger and empty the tank. Depending on your model of pump, you should be able to trigger it manually – just be careful when you do, if it doesn’t pump water and you keep it running it can overheat and fail. If you have an older style pump with a piggyback plug, remove the float pass-through plug and plug the pump in directly. This will manually turn on the pump and, if there is liquid water at the inlet of the pump, push that water into the drain field circuit. If you have any water source that needs to drain into the septic (furnace condensate, etc. ), consider fixing it. Furnaces can generate many gallons of condensate water per day. You could also just call for tank pumping to have it emptied – they are probably ready to thaw as needed to get the tank empty (especially this winter) and it would likely be cheaper and fix the issue if it is just your tank. Good luck, let us know if you fixed it. Thanks, for the advice, Gary. When I’m feeling better I’ll open the man-hole cover and take a look into the pump area. I also appreciate the warning about furnace condensate as I’m about to convert from oil to gas and have to make decisions in that area. I’ve just all these post and I think I have formulated my plan. I have an 80yo log cabin which pumps supply water from nearby river. Love to use cabin all winter on weekends so when we arrive we fire up gas log fireplace and archive warmth in 4-6 hrs. We always leave pink antifreeze in toilet and sink. Two winters big snow no problems. Last winter little snow and poor to stalled drainage upon flushing and sink.likely frozen line. Left as was came back next week drawing again, so back to normal use and return of halt of drainage. Jump to May and June and flushing normal yet strange (foul) odor. So I assume I dig up my floorboards, replace cracked and likely all drain system pipes heat tape and or insulate aggressively. The cabin has a cement foundation no access to crawls pace that I can tell and I will have to locate the soil drain n tank. Depending on the amount of movement, you could install a flexible elbow or connector that would flex with movement. I have a Monty Carlo 44footer 2 bedroom 5th wheel our septic tank is frozen there’s liquid C ommin out but the solids are frozen what do we do and how do we prevent future freezin? Great information! It looks like these guys ripped you off. Thanks much for the simple solution. We had a blockage on the outlet side of the tank, between the tank and the leachfield. Once we got setup, we had a clear line in approx. 15 min. 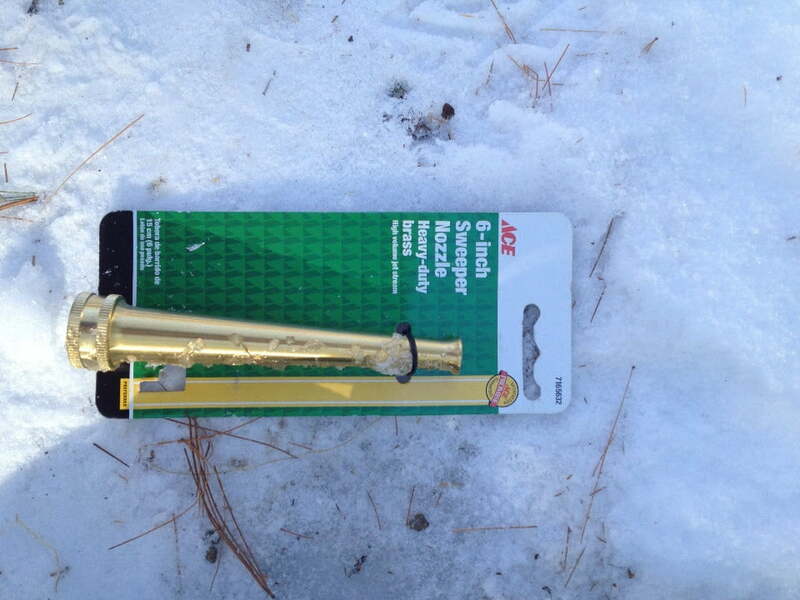 Our only purchase was a $6 brass nozzle (we had to buy an adjustable). We used a 100′ hose, connected to the hot water washer faucet. We’re still not sure what caused the frozen blockage, as only a few little “bits” washed back – no surprises. Thanks for the adding your experience and thanks for using our site! Interesting reading all the information and comments. The furnace is spot on and probably what froze our line. We were gone during a bad polar vortex in January. Our line was frozen beyond the tanks. We had them come out and fix but it refroze. We made the decision to just use the tanks as holding tanks until the ground thaws. Are you aware of any way now that it’s spring to help it thaw quicker? Will running a sprinkler over the box/drainfield area help it thaw quicker? Sorry to hear about your problems. The answer to your question really depends on your specific situation. If the entire holding tank is still frozen, working to warm the holding tank would likely help. If your problem is a frozen drain field, then warming the drain field would help, but the ground warming techniques I am aware of are likely cost prohibitive and typically used only for commercial applications – like powered warming blankets . Your best bet might be time and mother nature. In the future, you may consider insulating the ground over the drain field and holding tanks and/or adding an active heating system like the Septic Heater A200 I use at our cabin documented here. This unit will force warm air through the system when triggered by a drop in the temperature of the system. Our system has never frozen after we bought and installed the unit. They are expensive, but in the end worth it if your system is prone to freezing. Thanks for using the site and thanks for the question. to install an internal heat cable as it will eliminate a lot of head aches.